Sand ladders for a 15 ton overland truck??? I am still unable to find a decent set of sand ladders for a 15 ton overland truck. And please do not say Maxtrax because they only do those short plastic ones. I am looking for some decent aluminum ones at least 2.1 meters long with a 15 ton plus rating. Double welded up to 18 ton trucks. The two friends with similar sized trucks that have played around with sand ladders say the same thing, forget it. Airing down or winching off a similar sized vehicle are the best options. And I don’t think you need them to “ahold” 18 tons unless using them for bridging. If they are on some sort of surface, they can be rated lower. The old stand by PSP is not rated for bridging even a few tons, but work with aircraft carrying several tanks because of the surface area spreading the load. If you want bridging ladders, they will need to be engineered and made custom for the task. I have been searching unsuccessfully for years for suitable bridging ladders that are practical, packable and affordable. You'd think that with all the fabricators in the off-roading market these days, someone would see the opportunity. I've never needed traction mats, but I have many times had to terminate routes or improvise some precarious solution to washouts and severe ruts, where bridging ladders would have been a simpler solution. Fabricators just don't seem interested, perhaps due to the extensive testing bridging ladders would have to pass. Why not steel PSP? On a truck that heavy, the extra weight shouldn't be an issue. You posted about sand ladders, not bridging ladders, so these should work. Without trying to be annoying in not answering, what size tyres do you have or could you have? I had a camper on 395 85 R20 XZLs and at about 20psi the footprint was about (edited to say probably a bit less than 4 but more than 3) (from memory but I have some photos somewhere) 4 feet long. Wouldn't conditions have to be quite marginal to have maybe an alloy sand ladder on board to be big enough to carry, use and make a difference to flotation so you can drive out of something that that degree of tyre flotation couldn't deal with? Without trying to be annoying in not answering, what size tyres do you have or could you have? I had a camper on 395 85 R20 XZLs and at about 20psi the footprint was about (from memory but I have some photos somewhere) 4 feet long. Wouldn't conditions have to be quite marginal to have maybe an alloy sand ladder on board to be big enough to carry, use and make a difference to flotation so you can drive out of something that that degree of tyre flotation couldn't deal with? I have 5’ and 8’ PSP for my baby truck (only 9.5 ton). I have never needed them with the super singles but the 5’ ones worked well in fesh fesh with the skinny tires. They are also great as a door mat for those times when it is really muddy. I was looking for the fancy aluminum ones you see on all the European rigs until a German couple in a MAN camper stopped at our place and he told the story of the only time he used them of having to run over them numerous times to take the banana shape out of them after using them in sand. He has used them once in about 10 years. My take is you need more floatation, not sand ladders. Sand ladders are just 'make work' and the 'in' look for overlanders that follow the UK paradigm, and a security blanket for folks that don't have a lot of experience driving on sand. I've never needed sand ladders and keep lowering the pressure until I reach floatation equilibrium on blowsand. This experience was gained driving over a dozen 4WD's over 50 years and a lot of time on sand, including my light weight 5 ton truck camper on the dunes. Lowest pressure was 3 pounds on non-bead lock wheels on a 4K pound Jeep, and 18 pounds pressure on a 5 ton truck camper. Open this link for a short vid from my dropbox for a stroll up the Drop Off at the Dry Wash of the Devil in Anza: tire pressure 20 pounds on blowsand. Only once has this been insufficient. If you have a correct size winch (and the sure technique and know how to use it) there are ways. 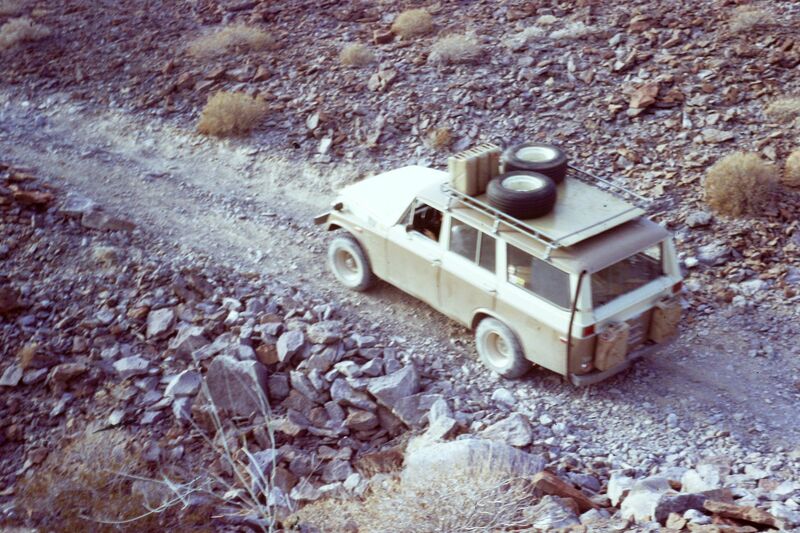 Back in the day I took 3 Japanese businessmen out near Palm Springs to do a little dune running with my Chevy powered Toyota Land Cruiser FJ-55. They had never seen the desert or been in a 4WD. I had wide wheels and tires with lots of sidewall for deflating. We played in the dunes with lowered pressure and then tried to cross a very fast mountain stream called White Water. It looked do-able and I started across the 2 foot deep, fast moving, 35 feet across stream. The bottom was bottomless. We sank to the gunnels. I opened the tailgate and luckily my spare was not underneath at that time but laying in the back. I lugged the tire wading through the current to the other side and about 20 feet over land. I made another trip to retrieve my shovel and X-lug wrench and with the Warn 8274 winch in free spool, dragged them across the current slogging up to the spare tire. Then I dug a 3.5 foot deep hole a little bigger than the size of the tire laying on the ground, which took a while, all the while the businessmen were looking wide-eyed through the windows of the Land Cruiser. I dropped the hook through the center hole of the tire and hooked it up to the X-lug wrench and cinched it up tight using the wire rope to drop the thing in the hole, then buried the spare. Then back to the winch to put it in gear, and back behind the wheel to pull the slack out of the wire rope. I left the engine running the whole time even though i don't think it was close to cavitation with the exhaust stack I had on the 55. The winch started to do its work and soon we were up on dry land. The only downside is the manual labor involved with this operation, especially the rescuing of the spare. One of the businessmen who spoke the most English asked with his 11 word vocabulary what this trick was called. I told him it was called the "dead man" technique. So, all the way home the 3 of them were chatting non-stop in Japanese with an occasional surfacing of the word, "DEADMAN!" 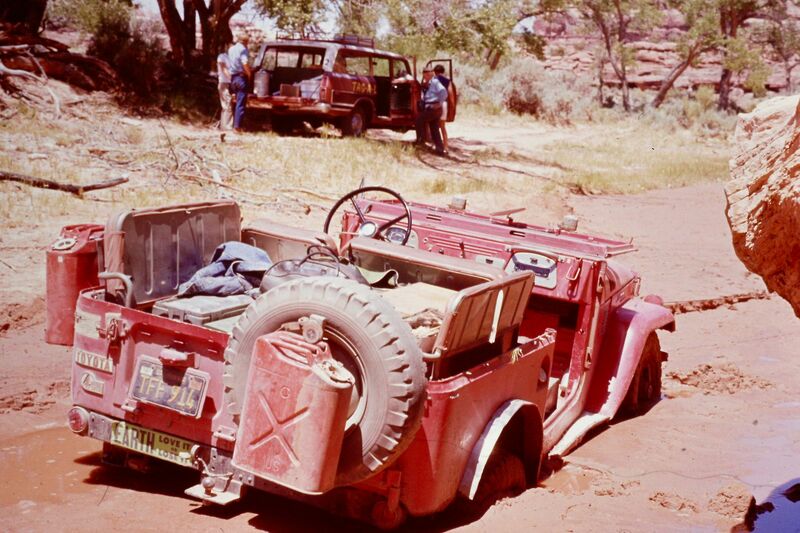 My only other experience like this was getting stuck in quicksand down Salt Creek in Canyonlands N.P. We just kept digging, jacking, and winching, finally getting out. I carry some of these in addition to Marston mats.